It’s not that I’m anti-social. I played high school and college golf, had a regular game with three buddies for years after that, even teed it up in pro-ams at a few famous country clubs. I would never miss my Rotary club’s annual tournament. But lately I’ve joined one of the most exclusive clubs of all — the tiny number of golfers who play alone. Golf is thought of as a social game, but it doesn’t have to be. According to the National Golf Foundation, 3 percent of golfers play as singletons. And it’s a whole ’nother game. The other morning, for instance, the course was wide open — all mine. One of my first shots veered toward a flowerbed. Hall of Famer Walter Hagen used to urge golfers to “be sure to smell the flowers” along the fairway, but even in Hagen’s day there wasn’t much time to lollygag. Everybody else was trying to beat him out of the 1927 PGA Championship! That’s how the game is usually played, as a march from tee to green with no time to lose. Next year, in fact, the official rules of golf are changing: As of 1 January, players will get only three minutes to look for a lost ball instead of five. I pushed the limit that day. And I not only smelled the flowers, but also found a couple of Titleists in the flowerbed. Playing alone brings your senses to bear on the game. The scent of mown grass. The earthy stink of my typical wedge shot, a divot of sod flying almost as far as the ball. The feel of the club in your hand; the breathtaking sight of a well-designed hole in the right light; the sound of a titanium driver smacking a polyurethane ball, a bang that echoes off trees just before my drive bounces off those same trees. I listen for birdsong, sprinklers hissing on the next fairway, and the unbeatable sound of a putt clonking into the cup. Of course, nothing is keeping you from soaking all that up during a Thursday men’s league, but social golf can be such a whirl of talk, jokes, bets, and hairpin turns in golf carts that you forget what a special place a golf course is: a patch of earth designed to test your skills and spirits until you stagger off for a well-earned beverage. You might not be the type who likes telling yourself golf jokes during solitary rounds. You may be more serious about the game. If so, you should start playing alone tomorrow, because it’s the best practice you’ll ever get. My game started improving the day I hit two balls off the first tee. Many if not most of us take a mulligan on the first tee: a do-over to keep us from throwing down our clubs and quitting the game. But instead of picking up the first ball that morning, I played both of them. Ninety minutes later I had finished nine holes with both balls — the equivalent of a full 18-hole round — and had the rest of the day ahead of me. Playing alone, I found I could hear the difference between solid contact and my usual foul balls. That’s the sort of feedback that golfers pay swing gurus for. Better yet was a tip I got from legendary Las Vegas gambler Bill Walters. Most golfers are familiar with formats such as best-ball events, in which each team uses the best of its players’ scores for each hole, and scrambles, in which players each tee off, then use the best shot and play on from there. “Worst-ball” golf is the opposite. And it’s maddening, especially at first, because all your best shots don’t count. If you knock a bunker shot into the hole, too bad — let’s see you do it again. 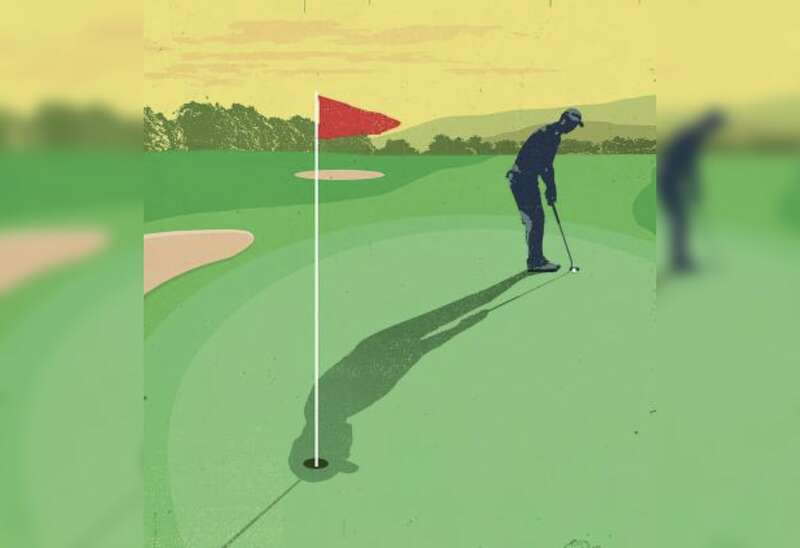 If you make a 20-foot putt, it only counts if you sink it twice in a row. My best worst-ball score is eight shots worse than my usual score. But it felt like a 59. Walters calls worst-ball the best practice for consistency. I think he’s right. In fact, I’m ready to make every Rotarian golfer a five-dollar bet: If you play five nine-hole worst-ball rounds and don’t think you’re a better player afterward, your next beer’s on me. Walk the course if you can. It’s easier to hear and feel the game without the cart. If walking is an option, get a Sunday bag and lighten your load from 14 clubs to eight or nine. In addition to making the walk easier, you’ll learn to hit a hard 9-iron, say, or a soft 7. And the next time you play in a league or tournament with a full set, it’ll feel like cheating. Not everyone can walk a course, and not every course is walkable. If you’re playing alone in a cart, ask the pro for a discount. Cart rates are set with the expectation of two players per cart; you might get it for half-price. If the course is crowded, you may be paired with other players. That’s when you play one ball like everybody else, show off your improving game, and learn new jokes. If you’re playing alone and catch up with a slow-playing group, ask politely to play through, then hit only one ball on that hole. Tell other players about solo golf. I got my son, Cal, to try it. A month later, playing a regular round with friends, he shot the best score of his life. If there’s a drawback to playing alone, it’s occasionally hitting a great shot that nobody sees. One day I knocked a 7-iron at the flag on a par-3 hole. The ball hopped once and rolled into the hole — the only ace I’ve ever made. I jumped, hollered, and looked around for a witness. There was only one, a horse on the far side of a fence, and he couldn’t sign my scorecard. I had to buy myself a drink.